Stigma, pay cuts, and risk of radiation exposure are among the reasons why 3,000 employees have left the utility at the center of Japan’s 2011 nuclear disaster. Now there’s an additional factor: better paying jobs in the feel good solar energy industry. Engineers and other employees at TEPCO, or Tokyo Electric Power Co, were once typical of Japan’s corporate culture that is famous for prizing loyalty to a single company and lifetime employment with it. But the March 2011 tsunami that swamped the coastal Fukushima Daiichi plant, sending three reactors into meltdown, changed that. TEPCO was widely criticized for being inadequately prepared for a tsunami despite Japan’s long history of being hit by giant waves and for its confused response to the disaster. The public turned hostile toward the nuclear industry and TEPCO, or “Toh-den,” as the Japanese say it, became a dirty word. 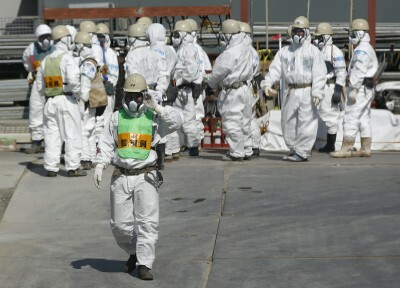 The exodus, which has reduced staff to about 35,700 people, adds to the challenges of the ongoing work at Fukushima Daiichi to keep meltdowns under control, remove the fuel cores and safely decommission the reactors, which is expected to take decades. The factors pushing workers out have piled up. The financial strain of the disaster has led to brutal salary cuts while ongoing problems at Fukushima, such as substantial leaks of irradiated water, have reinforced the image of a bumbling and irresponsible organization. “No one is going to want to work there, if they can help it”, said Akihiro Yoshikawa, who quit TEPCO in 2012. After leaving he started a campaign called “Appreciate Fukushima Workers,” trying to counter what he calls the “giant social stigma” attached to working at the Fukushima plant. Many of the workers were also victims of the nuclear disaster, as residents of the area, and lost their homes to no-go zones, adding to personal hardships. They also worry about the health effects of radiation on their children. The Fukushima stigma is such that some employees hide the fact they work at the plant. They even worry they will be turned away at restaurants or that their children will be bullied at school after a government report documented dozens of cases of discrimination. While TEPCO is out of favor with the public, the skills and experience of its employees that span the gamut of engineers, project managers, maintenance workers and construction and financial professionals, are not. Energy industry experience is in particular demand as the development of solar and other green energy businesses is pushed along in Japan by generous government subsidies. Currently the government pays solar plants 32 yen per kilowatt hour of energy. The so-called tariff for solar power varies by states and cities in the U.S., but they are as low as several cents. In Germany, it’s about 15 cents. Sean Travers, Japan president of EarthStream, a London-based recruitment company that specializes in energy jobs, has been scrambling to woo TEPCO employees as foreign companies do more clean energy business in Japan. “TEPCO employees are very well trained and have excellent knowledge of how the Japanese energy sector works, making them very attractive,” he said. Two top executives at U.S. solar companies doing business in Japan, First Solar director Karl Brutsaert and SunPower Japan director Takashi Sugihara, said they have interviewed former TEPCO employees for possible posts. Besides their experience, knowledge of how the utility industry works and their contacts, with both private industry and government bureaucracy, are prized assets. “It’s about the human network and the TEPCO employees have all the contacts,” said Travers, who says he has recruited about 20 people from TEPCO and is hoping to get more. Yoshikawa, the former TEPCO maintenance worker, said he has received several offers for green-energy jobs that paid far better than his salary at TEPCO of 3 million yen ($30,000) a year. Since September 2012, all TEPCO managers have had their salaries slashed by 30%, while workers in non-management positions had their pay reduced 20%. But last year, TEPCO doled out 100,000 yen bonuses to 5,000 managers as an incentive to stay on. In another effort to prevent the loss of qualified personnel, TEPCO is reducing the pay cuts to 7% from this month, but just for those involved in decommissioning the Fukushima plant. The departures, however, have not been arrested, partly because of ongoing financial pressure. TEPCO was bailed out by the government after the disaster. Compensating the thousands of people forced to evacuate from the vicinity of the plant is expected to weigh on the company for years. Given such dire conditions, it’s inevitable that TEPCO workers are looking to build careers elsewhere, according to Naoyuki Takaki, professor of nuclear engineering at Tokyo City University. Takaki recalled that Japan’s nuclear industry in its heyday had a magical allure like space exploration. He believes it is still a viable field of study and an important profession, bringing clear benefits for society. Takaki, a former TEPCO researcher who quit in 2008, said the number of students entering the nuclear field has shrunk after the disaster. That means the shortage of nuclear professionals could become even more critical in coming years. “TEPCO has grown into a target of people’s hate,” he said.